Everyone has an irrational culinary fear, right? I mean, it's not just me. Lots of people who are otherwise creative, intelligent beings suffer from pulse pounding, all out terror when faced with some specific culinary task. I have 2 left. It used to be 3. But I showed those cat head biscuits who was boss. 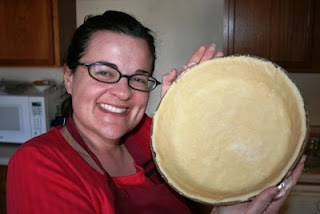 So now I'm down to 2: pie crust and rice. I think my culinary fears arise from my southern upbringing. I remember the wonderful smells and sights that came out of my parents' kitchen, then I feel inadequate because for the life of me I can't replicate them. My momma would probably say it's because I left my southern home and dared to venture out in the wild west. I suppose she has a point. The altitude (7500 feet above sea level) certainly isn't making anything easier. But with the help of a little Alton Brownian culinary science, I should be able to compensate for that, right?? 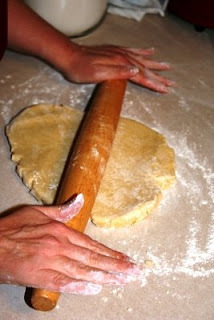 So I decided today was the day to confront my fear of making pie crust from scratch. The last time I attempted this feat, it resulted in a sore hand from becoming so enraged with the limp, fragile piece of dough that I slammed my fist down in sheer unadulterated rage. I'm sure the primal scream was heard for miles around our crappy little apartment. But today, I had karma on my side. I had just delivered a container of home made soup to a friend who recently had a baby, so I figured I had a little banked up good vibe. 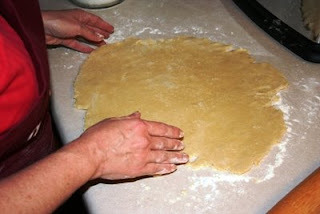 The pie dough recipe couldn't be simpler: 2 cups all purpose flour, 1 teaspoon salt and 1 1/2 sticks of butter. 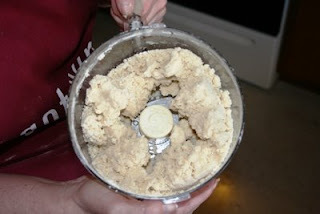 I even cheated and used the food processor. Dev gets the photo creds today, by the way. 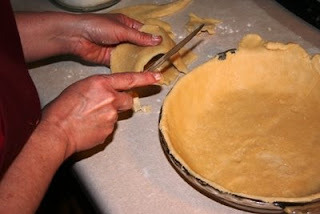 So, what did I put in my lovely home made pie crust?? All in all, I'd say it was a pretty good day. 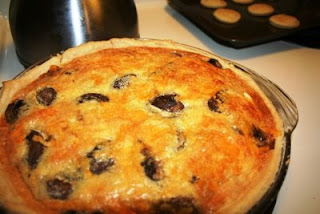 I'm not afraid of pie crust anymore. Hah. Those look yummy! 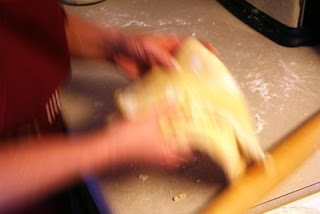 Brian is the pie maker around here, and his secret is to add an egg yolk, and a dash of apple cider vinegar to his pie crust and they always turn out great. 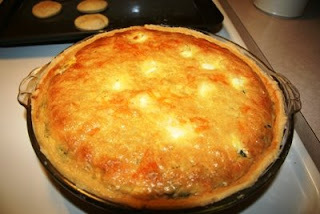 Bet that quiche will disappear fast at the potluck!